Quinoa (pronounced keen-wa) has become one of my new favorite things y'all! So of course, I am always looking at ways to use it in dishes. It's good for breakfast, lunch, dinner, snacks....you name it. 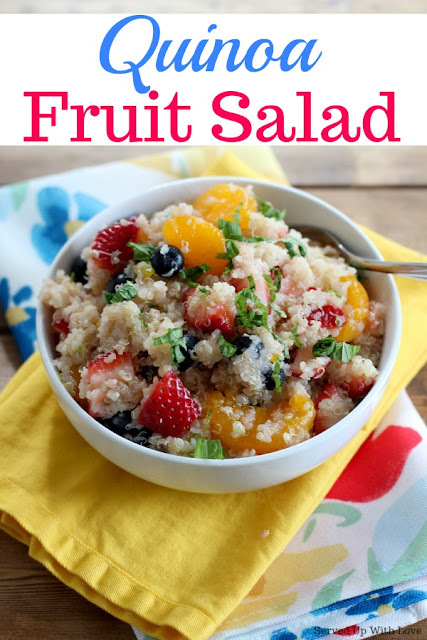 This Quinoa Fruit Salad is packed with citrus flavor from the lime and a touch of sweetness from honey, fresh strawberries, blueberries, and mandarin oranges. 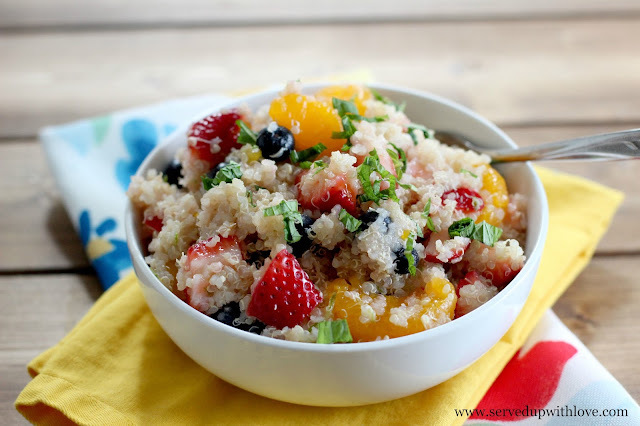 Quinoa is very similar to rice but it is just a little nuttier and a much more healthier for you. It is one of the few plant-based sources of complete protein. I will admit the first time I tried Quinoa I wasn't sure if it was going to be something that I would like. But, more than that, I wasn't sure if my picky family would give me a lot of grief over it. But much to my surprise, everyone really enjoyed it. Even the pickiest of eaters, my husband. He has become quite accustomed to trying new things. Of course, sometimes I just have to wing it and hope and pray he will eat it. But much to my surprise, everyone really enjoyed it. Even the pickiest of eaters, my husband. He has become quite accustomed to trying new things. Of course, sometimes I just have to wing it and hope and pray he will eat it. 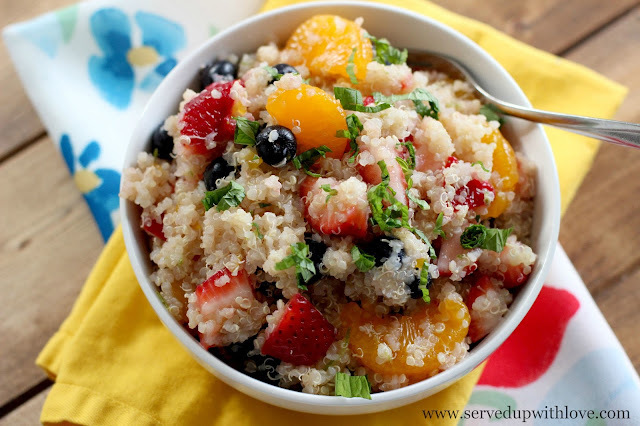 If you have been on the fence about trying Quinoa, go for it. You will be pleasantly surprised at just how delicious it is. Cook Quinoa according to package directions. (cook just like you would rice 2:1 ratio) Juice and zest two limes and place in a small bowl. Add honey and stir until combined. Set aside. Prepare fruit and place in a large bowl. Add cooked quinoa and stir until combined. Pour over the lime and honey mixture until mixed in. Garnish with fresh chopped mint. Can be served immediately or chilled in the fridge. 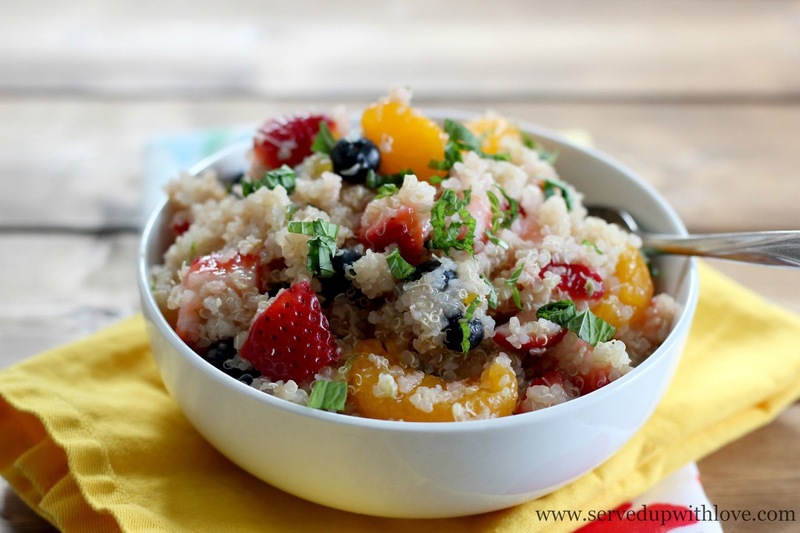 Have you ever tried Quinoa? Did you like it? I would love to know your thoughts.